In a pleasant coincidence, we’ll be in France the same time as our friends Neil and Mary. We decided to compare notes about our French itineraries over lunch. Neil grilled all-American burgers; I offered to bring a salad. I pondered the options. I had a few tomatoes, a few peppers and plenty of herbs. Sounds like a quinoa salad. Quelle bonne idée! Quinoa: Low-calorie, gluten-free, high-protein, tastes great. It’s my latest food fixation. Assume you know the story line by now. It’s an ancient grain harvested in the upper reaches of the Andes Mountains in Bolivia, Peru and Colombia. Latin Americans have been eating it for thousands of years. Vegetarians, of course, were hip to it before the rest of us. 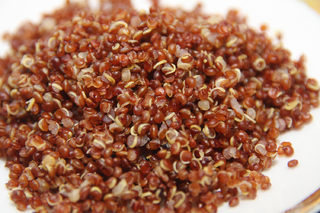 Quinoa has become such a raging success that there was even a shortage recently. It’s also incredibly versatile. A couple weeks ago, I “borrowed” a quinoa salad recipe first tried at Virtue Feed & Grain, one of Cathal Armstrong’s many restaurants in Alexandria. In addition to the grain, it had diced red beets, paper-thin radish slices, flat-leaf parsley and feta cheese. It was beautiful, and pretty tasty too. This time I subbed in what I had on hand from the garden. Send me your best ideas for quinoa – I’m in the mood! Bring the liquid to a boil. Stir in the quinoa, return to a simmer, cover, then cook until the liquid is absorbed – about 15 minutes. Remove from heat, fluff the quinoa with a fork, and let cool. Meanwhile, dice the pepper, tomato and herbs. When the quinoa is cool, add the veg, the vinaigrette, salt/pepper to taste. Serves 4 as a side dish. Bon appetit! P.S. My friend Kyle suggests toasting the quinoa for a few minutes before adding the liquid. She says it adds a nutty flavor to the grain.